A loan of $725 helped to buy irrigation pipes. Faith lives in the Eldoret area of Kenya, which is home to the main campus of Moi University. She has one child and has been in the farming business for four years. 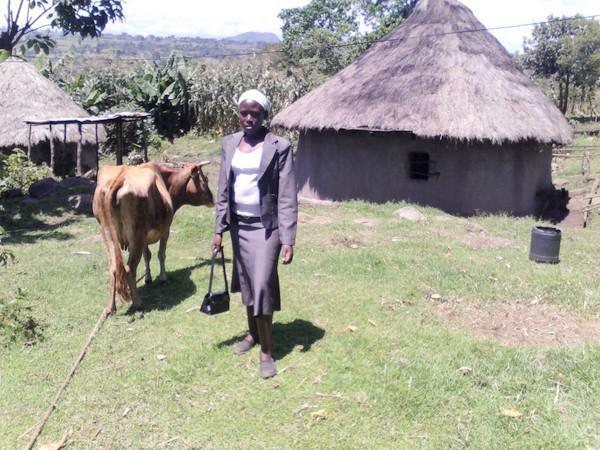 Her primary income sources are milk, eggs, crops, transportation services and personal business. She will use the loan to buy irrigation water pipes. She stated what is most enjoyable about farming: She loves traveling, and her business enables her to travel a lot when taking commodities around! Her biggest challenges are: The business is sometimes seasonal, and when people don't have cash, she lacks customers. The dairy cow on the farm has been given the name of Samoi. Faith was asked why she chose Juhudi Kilimo for this loan, to which she replied: "[I] was told by a relative who lives in litein." This client was also asked what was learned during Juhudi's required micro-finance training session and she replied that she has learned about credit management and how to save. Her highest monthly expense is school fees. When asked, "How will this loan benefit your family?" Faith replied that from the loan, she will be able increase her income and thus take her kid to a good grade school. As part of Juhudi's loan appraisal process, each borrower's assets are evaluated. Faith owns the following: a cow, poultry and a motorcycle, but does not own a pig, a pump, a bicycle or automobile. Juhudi Kilimo also tries to measure any change in living standards based on this loan. This borrower has mosquito net in the household, but does not have electricity, solar power, running water, a sewing machine, a TV or DVD. Note: To create this loan profile, Juhudi Kilimo used a mobile device to gather information in the field and send the data to a central online repository, thus reducing paper use, making the process more efficient and keeping costs down.